With its 60mm aperture, this telescope gathers 70X more light than the naked eye and so is a typical beginner's telescope. 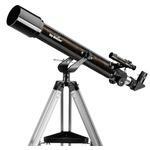 With its maximum magnification of 120X, it can show you detail on the planets Saturn, Jupiter, and Mars. The cratered landscape of the Moon is also well worth observing, and you can watch this changing with the different lighting conditions arising from the changing phase. Fascinating nature watching during daylight hours is also possible by adding an erecting lens or an Amici prism. Focusing is carried out by means of an adjustment knob on the rack and pinion focuser. 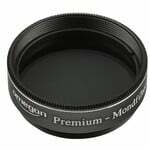 This allows the focusing sharpness to be always precisely set and for it to remain fixed during observing. This is also a useful acquisition for advanced astronomers or when changing to a more powerful system as the optics are well suited for use as a guide scope which can be mounted on top of a larger telescope and used to take pictures or to guide with. 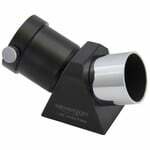 This mount is very popular with beginners in astronomy as it is very simple to operate. The entire telescope is very easy to move around in both azimuth and elevation. For beginners, it has the advantage that they do not have to worry about first aligning the telescope before use. 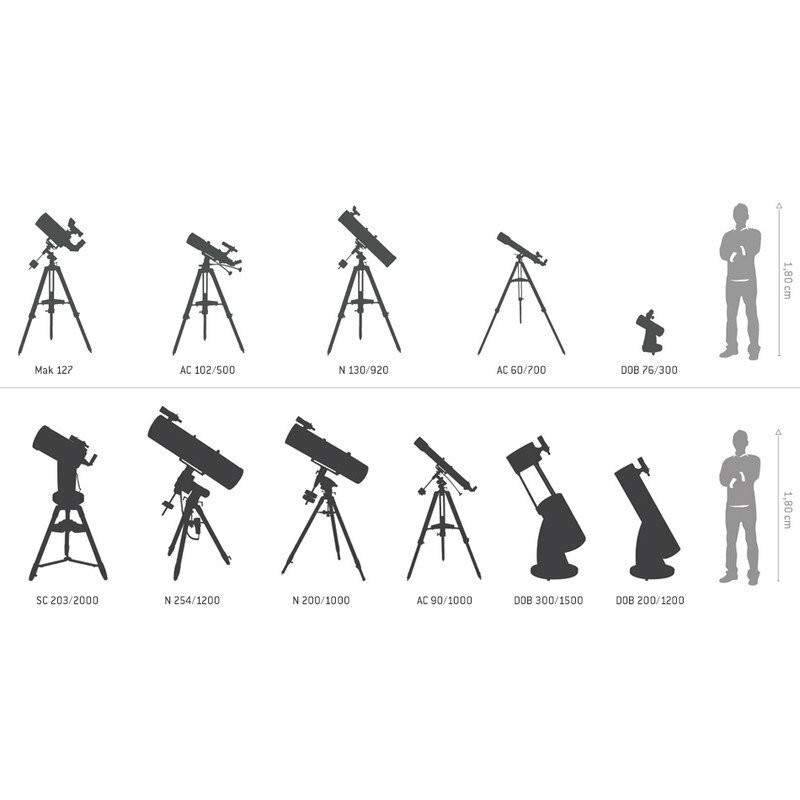 Setting up the telescope is hence very quick and straightforward: Simply erect the tripod and mount, attach the telescope to it, and you are ready to go! The fine adjusters can be locked in both axes so that objects remain in the field of view once found. The mount is attached to a height-adjustable aluminium tripod. 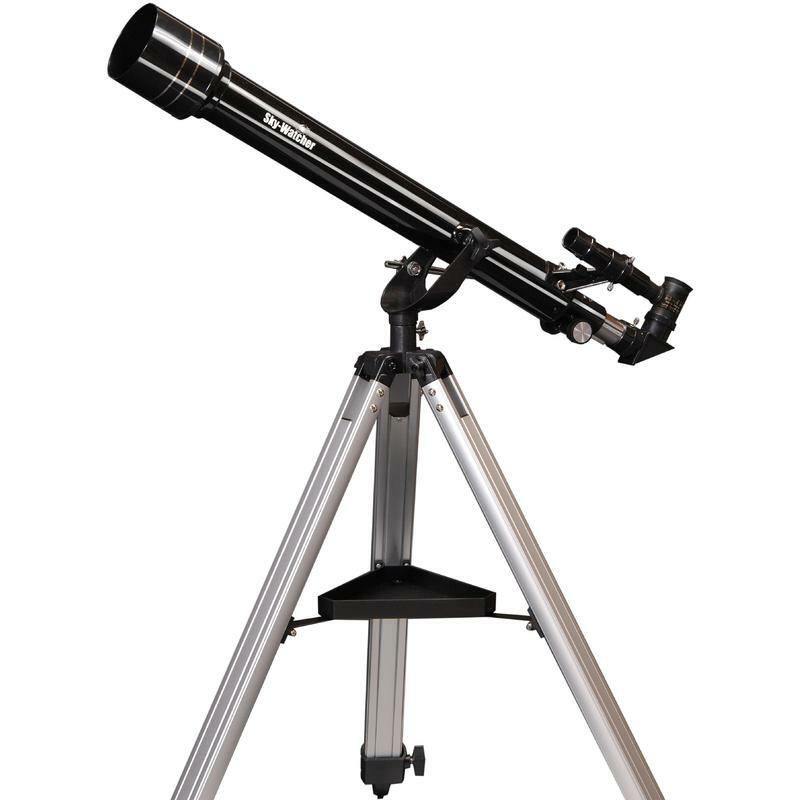 This telescope is quite suitable for the first fun exploration of the night sky. Observing the moon is an impressive experience even in a small instrument such as this. The mount also allows terrestrial observing. But you should not expect high performance from a telescope in this price bracket. A note regarding magnification: Similar telescopes are advertised in many places with magnifications of over 300X or even 600X. Any telescope can theoretically reach these magnifications, but you will not be able to see anything - everything will be blurred! 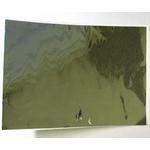 The maximum useful magnification is that at which objects can still just be sharply imaged. This telescope in an excellent choice for children, but young people of over 10 years of age and adults will definitely get more pleasure out of a Newtonian telescope such as the Omegon 114/900 EQ-1. It is a good idea to get some idea of how to orient yourself in the night sky by first reading some books on the subject. There are various books available which tell you how to get better acquainted with the night sky.